Zion Market Research has published a new report titled “Security and Surveillance Radar Market by Type of Platform (Maritime Security & Surveillance Radar, Land-Based Security & Surveillance Radar, and Airborne Security & Surveillance Radar): Global Industry Perspective, Comprehensive Analysis, and Forecast, 2017- 2024”. 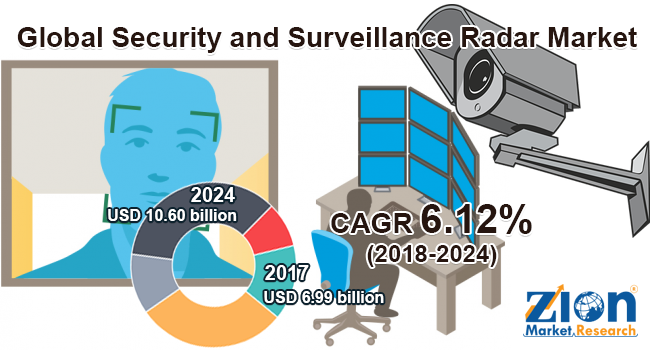 According to the report, the global security and surveillance radar market accounted for around USD 6.99 billion in 2017 and is expected to reach approximately USD 10.60 billion by 2024 globally, growing at a CAGR of around 6.12% between 2018 and 2024. The highly capable radar has several advantages related to security along with surveillance applications that primarily include perimeter security, airport perimeter protection, base protection, border protection, and some other critical infrastructure sites such as ports and harbors. It allows early warning & provides time to build up a reply to threat dipping the need for obstacles and wire fences and other security controls. Naval radar surveillance is perfectly suited for high-definition sea surface surveillance and short-range air surveillance for ship navigation and helicopter control. The growth of global security and surveillance radar market is mainly attributed to the increased number of navigation radars used by UAV (Unmanned Air Vehicles). Furthermore, amplified procurement for national security, increasing demand for lightweight radars, energy-efficiency over traditional radar is predicted to favor the security and surveillance radar market growth. Moreover, modernization and replenishment programs are expected to spur security and surveillance radar market in the years to come. On a contrary, continuous changes in military operations are expected to have an adverse impact on the security and surveillance radar market. Even so, technological advancements in radar system may disclose new avenues for the security and surveillance radar market in the near future. Maritime security and surveillance radar type of platform segment are expected to attract a remarkable market share for security and surveillance radar market in the coming years. The rise in the number of navigation radars which are used by UAV is predicted to drive airborne security and surveillance radar segment massively. Air defense radars and surveillance radars are also used for ground security, marine, airspace applications to watch a range of targets including unmanned aerial systems, ultralights, aircraft, ships, boats, helicopters, vehicles, etc. In 2017, North America was the leading regional market for security and surveillance radar market. Modernization and replenishment programs in countries such as the U.S. and Canada emerged as a major factor that fueled the growth of security and surveillance radar market in this region. The present technological advancement and energy efficiency of this radar and increasing demand for land-based security and surveillance radar will be the key factors to boost the demand for security and surveillance radar market in Europe. The Asia Pacific is considered the fastest emerging market owing to the fact that various firms are now spending on multi-mission aircraft, UAVs, and civil helicopters that are used for civil security air surveillance. Key players in this market are Northrop Grumman, SAAB, Rockwell Collins, Thales Group, Boeing, Israel Aerospace Industries, Raytheon Co., Airbus Group, BAE Systems, Cobham Plc, Kelvin Hughes, ATC Global, Exelis, Scanter, Honeywell International, Lockheed Martin, and Finmeccanica, amongst others.